Jupiter Hell - DRL Spiritual Successor Kickstarter is LIVE! Jupiter Hell , the spiritual successor to DRL has launched on Kickstarter NOW!. Please check out the pitch video, and help us out! This release is dedicated to NEW content. There are several new special levels paired with the old ones for greater randomness! Visit the Military Base, find Mt. Erebus or feel the dread of Limbo. Along with new special levels, there are new level generators and enhancements to the old ones. For the pro-players, we have brand-new Dual-Angel and Archangel challenges (with a corresponding hidden Badge level), and Custom challenges for everyone. Be sure to also check out Gunrunner, the new Scout master trait! And if that isn’t enough, we’ll give you more content soon, this time easier than ever, for DRL comes equipped with a connection to the ChaosForge ModServer! Expect new mods, new challenge maps (for which you can gain badges!) to appear on a regular basis! Grab it while it’s hot in the downloads section, for Windows, Linux or Mac OS X ( bundle! ) ! However, before you do, please take a moment and Like! our official ChaosForge Facebook Page and/or ChaosForge Google+ Page , as well as follow @ChaosForge and @epyoncf on Twitter to stay informed of news of work on the next release! If you’re a returning player (or a donation driven development supporter!) consider donating to ChaosForge to celebrate the release! Download the new version to jump into the fun or join us on IRC ( #chaosforge on QuakeNet ) or the ChaosForge Forum to celebrate or read below for the full changelog! ChaosForge Donation Drive - initial goal reached, Stretch Goals posted! Thanks to many great people, we have reached our initial goal, thank you everyone! As promised, we also publish the stretch goals for this Donation Drive — if you love DRL, you’ll love these! Head to the forum and read all about them! 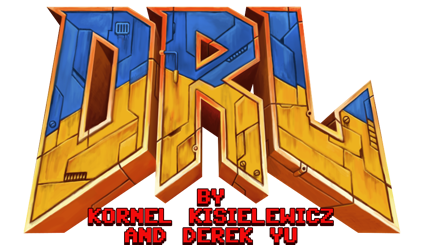 DRL (D**m, the Roguelike) is a fast and furious coffee-break Roguelike game, that is heavily inspired by the popular FPS game Doom by ID Software.